Size: Portrait 38.5 x 30.5cm; Landscape 30.5 x 38.5cm. Contains 20 photo pages, available in either black or cream and 20 silk sheets available in various colours (see silk sheet papers). Different shades of natural paper available (see handmade range of papers). 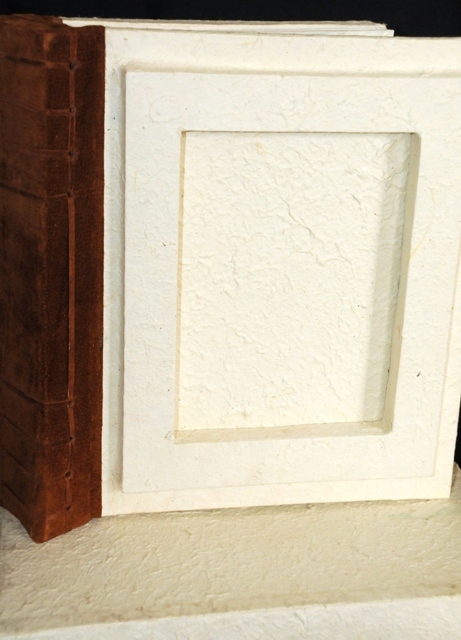 A photo frame is included on the cover and it has a suede leather binding. A CD box is inset in the back cover of the album for storing your wedding photo's or video. A matching plain storage box is included.